Officials have prioritized diversity since hiring Terri Harris Reed as vice provost for diversity and inclusion in 2011. As officials hone in on diversity, GW has found itself without a permanent chief of diversity efforts. Vice Provost for Diversity and Inclusion Terri Harris Reed will head to Spelman College, a historically black women’s college, after about four years at GW. She came to GW from Princeton to fill a custom-made role tasked with a tall order – increase diversity hiring – which could falter without a permanent official to continue the effort. Faculty diversity rates have remained relatively steady during Reed’s years at GW, but she and experts have said that seeing progress in that area, which also involves keeping diverse faculty at GW once they’re hired, is more of a long-term goal than a short-term push. The University named Vanessa Perry, who is currently serving as an interim associate dean of graduate students in the business school, as interim vice provost. Officials will launch a national search for a permanent replacement this fall. Two experts said Reed’s replacement will have to be determined and committed to diversity efforts, an area in which they said is challenging to see significant change because systemic issues make it hard for minorities to move up in higher education. Reed did not return a request for comment. She has not sat for an interview with The Hatchet since January 2014. She is the third top-level official to leave GW or announce a resignation this month. When Reed came to GW, University President Steven Knapp and Provost Steven Lerman gave her six year-long goals in areas like campus outreach and diversity training – areas that were spotlighted in a diversity report that came out of a task force Knapp created in 2010. Reed was also key in the hiring of two top-level officials who are black: Dean of the Columbian College of Arts and Sciences Ben Vinson and Vice Provost for Budget and Finance Rene Stewart O’Neal. Vinson and O’Neal are two of nine black top-level officials, including Reed, who have been named to posts since 2010. 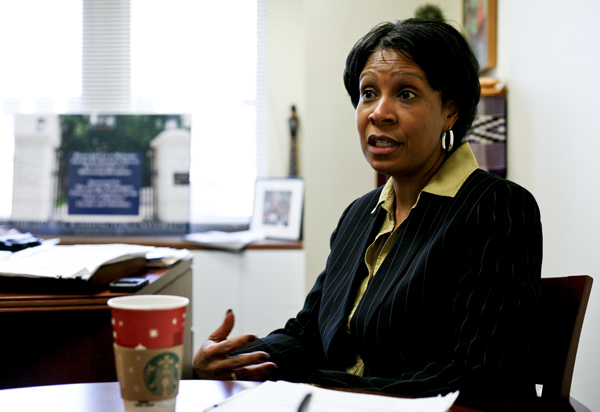 Officials have prioritized diversity in hiring since Knapp came to GW in 2007. Since Reed came to GW, officials have incentivized departments to hire minorities and women by covering half of their salary for three years with money from GW’s central budget. Lerman said last spring that this incentive has covered between roughly three and six hires for the past several years. Lerman also announced last spring that the majority of GW’s new tenure-track faculty hires were women. A net of about 260 female tenure-track and non-tenured faculty have been added over the last decade. While the number of female faculty has steadily increased, other minorities’ representation has not changed much during Reed’s tenure. Minorities make up about a quarter of GW’s faculty, a number that has seen relatively little change since 2011. About 14 percent of faculty in 2013 were Asian – a 3 percent increase since 2005. In that time frame, black faculty increased 1 percentage point, according to data from the provost’s office. But getting and retaining minority faculty can be difficult for universities because minority faculty are often called upon to serve on special committees or mentor students – tasks they have said can bog down their work life and lead to burnout. Reed also took on additional duties during her years at GW. She was the chair of an affordability task force that Knapp created in January 2014. The group has remained largely under the radar since it was created, but did play a role in GW’s shift to a test-optional admissions structure this summer. She was also temporarily in charge of GW’s Title IX efforts, ensuring the University was in line with federal regulations on discrimination and sexual assault. The head position in that office, GW’s Title IX coordinator, was vacant for nearly a year until officials hired Rory Muhammad last October. Before he was hired, Reed split Title IX duties – an area experts have said has become one of the most demanding in higher education – with Victims Services Coordinator Suzanne Combs. Albert Camarillo, the special assistant to the provost for faculty diversity at Stanford University, said whoever replaces Reed will have to decide which areas to prioritize to make sure certain initiatives stay on track. Camarillo added that universities that push for more diverse faculty now will see the payoff over the next decade. He added that having a more diverse faculty could encourage more diverse students to attend GW because minority faculty can serve as role models. About 6 percent of undergraduate students are black and about 8 percent are Hispanic, according to 2014 data from the Office of Institutional Research. Samantha Seiler and Justine Coleman contributed reporting.